Apparently there are quite a few horsemen and Horseplayers alike talking about what happened in the fourth race at Woodbine last Thursday. I received a few emails on it as well. 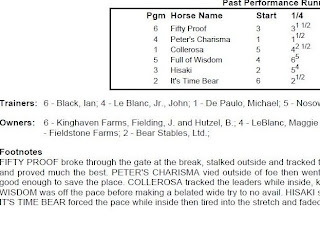 It is pretty clear, just by watching the replay of the race that that the heavy favorite and subsequent winner, Fifty Proof, got a head start before the gates were opened for the other horses in the race. He should have been declared a non-starter. It is the opinion of the few I have spoke with on this that there is no way the Stewards missed it (one of the first things they look at is the start of the race). This brings up the obvious question as to why the inquiry sign did not go up? It was the first leg of the Pick 4, and over $45,000 was bet on it. If Fifty Proof was declared a non-starter, those holding live tickets off him would have been given the new favorite, and their tickets would be dead. This would have caused a lot of unrest amongst some bettors. Fifty Proof's scratch would have also necessitated in a refund of about $75,000. did that have something to do with it? But the owner of the horse could have something to do with the non call. Kinghaven Farms is a partner on Fifty Proof. Perception is very important in horse racing, and even if this had nothing to do with the non call, it is hard to convince many horseman and Horseplayers, whom are skeptical by nature. Did the Stewards give former Chief Executive Officer David Willmot a going away present? The race is now under appeal with the Ontario Racing Commission. I can't see the results standing. UPDATE: Last year, August 15th Race 4, Indian Apple Is broke through the gate and got a head start. She was 1-5, the inquiry was called, and the horse was declared a non-starter. 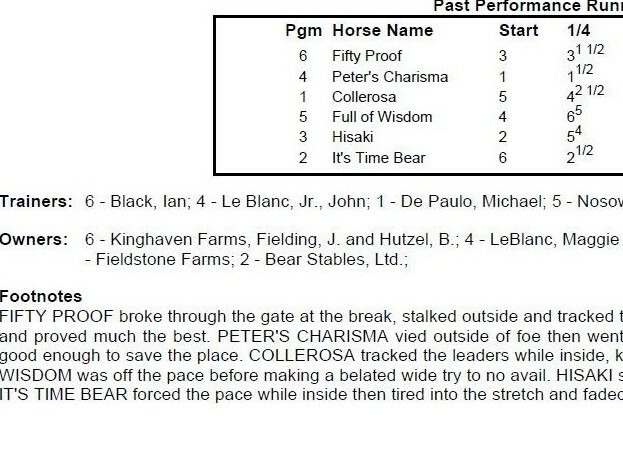 UPDATE 2 The Stewards and John Leblanc, trainer of the 2nd finisher in the race met on Friday and the protest was denied. It was decided that no unfair advantage was gained by Fifty Proof. Huh? First off, that really shouldn't matter. In the Olympics if a runner starts before the gun goes off, a recall occurs. In other words, if a horse breaks through the gate, the horse should lose its right to compete for the prize and should be refunded. And of course, what about consistency. How was this different that Indian Apple Is? And I also remember a few incidences when the gate was open even less, and the horse in question finished up the track, and a refund was given because the horse broke through the gate before the gate officially opened. UPDATE 3: This case will go to the ORC for appeal. With precedence in place, I can't see the results standing. Doesn't help the bettors of the 2nd finisher for their win tickets, exactors, Pick 3's and Pick 4, etc. Another question, in the short time between the finish of the race and the time the official sign went up, how did the Stewards determine that there was no unfair advantage gained by Fifty Plus without even an Inquiry? And again, the fact that the horse broke out before the rest of the field should be deemed an unfair advantage.....end of story. UPDATE 4: How can the Stewards argue against the ORC Rulebook? 11.16 A horse is a starter for all purposes of the Rules when the stall doors of the starting gate open in front of it at the time the starter dispatches the horses in a valid start. Fifty Proof was not a starter by ORC rules. The gate did not open for Fifty Proof when the starter dispatched the horses, but before. and it didn't open in front of the horse at the time the starter dispatched the horses either. According to a release at the ORC web site, Fort Erie will race quarter horses on three Saturdays in October. Also, a make-up date of Saturday October 23 has been added to the thoroughbred schedule. On that last weekend, post times have been changed from 1:30 PM to 12:30 PM. The Prince of Wales was a very exciting race. Announcer Peter Kyte's exuberance has triggered a thread on Pace Advantage. I couldn't have picked the winner, Golden Moka, in a gazillion years. Not the way I handicap. Horses making their first start after a long layoff in a Stake races of over a mile are automatic pitches for me. They don't win very often, and I'm still sticking with my rules the next time a situation like this happens. Either Golden Moka is special, or the competition was was sub par. I guess we will find out pretty soon which is the case. On track handle was off about 2% from last year, but handle from other sources was down over 20%. Saratoga starting up early could be part of the blame, and of course racing is down this year collectively too, but it is possible that more and more Horseplayers have become aware of the high takeouts Fort Erie dings the public with. The Ontario Racing Commission wants public input on proposed rule changes. Click here to view them. 'Just in time for these premier meets, TrackMaster has made some significant improvements to its Thoroughbred product line. Many of these changes were a result of a meeting we had with the guys from HANA (Horse Players Association of North America), a smart group who has given a voice and influence in the industry for the “player”. I have to go against the home team. No horse has yet to win the Prince Of Wales after winning the Plate on polytrack. I think that is the least of what Big Red Mike has to overcome. Big Red Mike benefited from the best speed track since Polytrack replaced dirt at Woodbine. He also suffered from the heat in the Plate which was only 21 days ago. His last two races were gate to wire, and I don't see him sniffing the lead with Golden Moka (it is possible he could have a five length lead early on) and Mobil Unit in the race. The rail was also golden on Plate Day. Big Red Mike had a double bias going for him, but two main contenders ran against the bias. Hotep, though up close early, was outside the entire race, and had Big Red Mike been chasing Hotep on the outside, I would expect Hotep to have won the Plate by open lengths. A horse who was totally screwed because of his post position was Mobthewarrior. He now goes from the twelve post to the one post. He made what looked to be a possible winning move around the far turn, but running against both biases might have cost him up to 6 or 7 lengths. He would have to have been a super horse to have swept by the top pair. Today, he won't have to be that good, though his breeding for the distance is still a question mark. The rest of the field today are a bunch of pretenders. Perhaps Captain Canuck will close for a piece in the triactor or superfecta. Gotta go with the value. Mobthewarrior and Hotep. Box them. As for horizontal bets, one of those two will win today's race. 26.2% on exactor and daily doubles in out and out robbery. Personally, I hate searching the ORC site for rulings. Most are stale, and they are very slow to update them. Hopefully, Woodbine will make an effort to post information in a timely matter. Racing Medication and Testing Emporium have a recent rulings data base. It is interesting to see what prohibited drugs are in vogue these days and by guiding your mouse over the drug you can see what the drug is used for. Of course, my contention that any trainer hitting at 25% or better, over a large enough sample (100 races or so), is using something undetectable, still stands. Transparency is a good thing. When it comes to racing fines and suspensions, it inevitably will lead to a cleaner game which will instill confidence amongst the bettors and fans. Woodbine will probably lobby to have control of it, but why should any track? This could be a huge blow to any chance for horse racing to grow. The industry failed to compete, and still fails to compete with other forms of gambling that have much lower house takes. Pocono Downs, the used to have the highest specific takeout for any North American track, harness or thoroughbred. If you can believe it, they were charging 35% to Horseplayers on both triactor and superfecta wagers. That is going to change come August 2nd, when they lower the takeout on both wagers to 25%, which is still on the high side, but it is still a good start. This means that Pocono will have a lower takeout on tris and supers than Woodbine which has a takeout rate of 27% for triactors, and 26.3% for supers. Incidentally, the highest takeout in North America now belongs to Penn National which has a triactor takeout of 31%. On supers Penn charges 30% which is what Philly Park charges for both triactors and supers. The lowest takeout in North America for triactors and supers is 19% and belongs to Keeneland and Churchill Downs. The lowest takeout for any bet in North America is 12% (Retama for Pick 3's and doubles and Sam Houston for the Pick 3). The lowest takeout on WPS belongs to harness track Tioga Downs (15%), they also have the lowest takeout on exactors in North America (17%). To me, this move by Pocono happened because of mounting awareness over track takeout thanks very much to The Horseplayers Association Of North America. They were almost forced into this "experiment" as they like to call it, because they will be hosting The Breeders Crown this year, and at 35% their takeout rates would definitely be flashed all over the place, probably hurting their potential business immensely. Richard Eng recently got interviewed by Trot Radio regarding his ideas about lowering takeout. Listen to it here. He dispels the myth that takeout doesn't matter because most Horseplayers don't know or care about it. The reality is that if a player cashes more, the player bets back more, lasts longer, and the more the person leaves the track with, the more likely they are to come back. Lowering takeout is not a short term savior but a long term one. But increasing takeout, focusing on marketing high takeout bets, or doing nothing will only continue to kill the game as new Horseplayers do not come close to replacing those who quit or die. Hollywood Park just announced a 10% drop in handle for their recently ended meet, Lone Star was off a whopping 21%, so bad that Lone Star President, Drew Shubeck state that he is considering lowering track takeout next year. Why racetrack execs are waiting so long is still mind boggling. Meanwhile, some good news, Indiana Downs was up 3% over last year. Indiana Downs has relatively lower track takeouts (especially on triactors and supers; 21.5%), but most importantly distributes their signal to all ADWs, and at a reasonable level. They were graded an A for signal distribution by HANA. Hollywood was rated a D, while Lone Star earned an E (being a Tracknet track where they don't distribute to all ADWs, limit rebates, and charge a fee that is above average). There seems to be a shift, as more and more Horseplayers look for rebates, if they live in a jurisdiction where they can get them, towards tracks that offer the best net takeout (track takeout minus rebate). This is true amongst the biggest players as well. Value is becoming a key word amongst the regular players more than ever. Fort Erie is destined to suffer handle wise as they have yet to do anything about their ridiculously high takeouts. They basically stick it to their on track customer by charging 26.2% for almost every exotic (28.2% for triactors). Think about it, how is a business expected to grow their live customer base when they take out 26.2% on exactors and doubles. When it comes to the daily double, Fort Erie has the highest takeout in all of North America, and they have the second highest takeout when it comes to exactors. 8. The sport has finally turned a corner in how it regards people who abuse their animals. Many tracks have put in rules that lead to the ban of anyone caught sending a horse to slaughter. And Woodbine sent a strong message when it banned owner Bruno Schickedanz and his trainer after they violated track rules and worked out 13-year-old Wake at Noon, a former Canadian Horse of the Year. It was a callous effort to squeeze every last nickel out of a horse that had been very good to them, and it cost the horse his life. It should be noted that not everyone is taking this matter as seriously as they should. Since the ban went into place, Schickedanz has started horses at Fort Erie, Mountaineer, Presque Isle and Thistledown. Shame on those tracks. Until the Ontario Racing Commission rules on Schickedanz, it is proper business to allow him to race. I would argue that Woodbine should also allow him to race as well. If the ORC finds Schickedanz did nothing wrong, or something that warrants only a slap on the wrist, tracks that refuse his entry could be in for possible legal actions. Again, I think what Bruno Schickedanz did was deplorable and disgusting, but was it illegal the way the rules are written now? The Prince Of Wales draws today in Fort Erie. Since I didn't get an invitation to the event, I won't be covering it:) But if you want some good info on the Prince of Wales check out Triple Dead Heat. I wonder if he got an invite. Keith is much nicer than I am. The appeal process really pisses off many Horseplayers who believe that tracks are one step behind drug trainers to begin with, and even if they are caught they either get a slap on the wrist or are allowed to train thanks to a lengthy appeal process. Horseplayers want to see rules with a bite that create actual deterrence. In this case, the violation happened in April, and the appeal date is yet to be determined. Finally, a heart warming story about a new friendship between jockey Eurico Rosa Da Silva and a (formerly) troubled teenage fan. Emotion sometimes leads to stupidity, and stupidity reigned supreme in the jock's room at Fort Erie on Tuesday. For those who don't know, leading jockey Krista Carignan was abruptly taken off her mounts because it was confirmed after a lunch time meeting with the Stewards that she committed her fourth whipping violation of the year on Sunday. The new whipping and urging rules in Ontario state that the driver or jockey is immediately indefinitely suspended after the fourth violation. Thems the rules, like it or not. But the jockeys, who have been complaining about the new rules all year long, decided that it was time to take a stand. They banded together and refused to ride any of Carignan's mounts. First off, the act of getting licensed for jockey, groom, trainer, etc. implies that you will abide by the rules of racing. In other words, the jocks had no grounds to react like they did, though I do not believe they broke any rules by colluding the way they did. But who did they hurt with this decision? Just about everyone except the ones they have the beef with (The Ontario Racing Commission). Trainers get horses ready for specific races. Carignan being the leading jockey most likely had mounts that would have made relatively substantial money that afternoon. The trainers of Carignan's mounts were all denied an opportunity to make their profits. The owners got screwed. Probably the odd one showed up to watch their horse in person (scratches were not announced until around the 2nd race as Carignan's first mount was in the 3rd race). Of course, they had to pay for Lasix, but they also pay the day pay that keeps the backstretch going. Now they all have to wait at least another week for perhaps a not so good spot to run in. Horse racing's growth depends a lot on satisfied owners. They bring friends and family to the track, some owners are potential big owners down the road, and of course friends and family are potential new owners and new horseplayers. When a track is offering purses on the lower end of the scale like Fort Erie, these unnecessary speed bumps can only do damage. And the last thing that Fort Erie needs is any speed bumps as they struggle for survival. Handle seems to be down this year (as it is for North America collectively). And Tuesday is Fort Erie's biggest handle day. Handle for Fort Erie is dependent on two main things: competition and field size. The last thing Fort Erie needed was 6 or 7 unnecessary scratches that resulted in already short fields to be much shorter. I do agree with the jockeys on their points. Yes, it seems that whipping violations are open for too much subjectivity and also cause jocks to worry about too many things when they are trying to win a race (Carignan's fourth violation was simply holding the whip too high...talk about walking on egg shells), and the fines being equal at both Woodbine and Fort Erie are relatively greater at Fort Erie because of the much larger purses at Woodbine. I also believe that whipping violations should be subject to immediate inquiry before a race is made official. If a jockey is "cheating" to win, the horse should be DQ'ed. Lets face it, if a jockey was found using a buzzer during the race on the tapes, the horse would be thrown out. The Stewards turned the indefinite suspension to three days and a years probation, so maybe the jockeys move of not accepting mounts intimidated them and perhaps they will revisit the way the rules are written. I've made this point before, but as a bettor, I hate these rules because if my horse needs to be whipped to win, I want it whipped without the jockey doing a count in his or her head. Ontario has already moved to a more human whip. And of course, if I thought the horse was suffering due to whips, I would be totally against them (the welfare of the animal is extremely important but I think these rules go too far as a way to appease the PETA types). I guess what I'm trying to say is if whips are bad for the horse, then ban them outright, if not, amount of hits shouldn't even be looked at. The only good thing that came out of this is Fort Erie got some press. Maybe a few gamblers found out that they still race horses in Fort Erie. I'm definitely noticing an increase in handle at Woodbine. Lots of it has to do with being featured on TVG. The big fields are helping. Maybe even Race Night on the Score is helping as well. They are probably getting a boost because they are now back on RGS's betting schedule. RGS is an offshore rebate shop that caters to bettors who wager in the millions each year. Woodbine underperformed plenty under David Willmot's leadership. Things have improved under Nick Eaves, and they have a chance to really blossom now. If Woodbine would only lower their takeout while they have momentum and newbies joining up, they could catapult themselves as one of the major tracks, when it comes to handle, in North America. Their takeouts for triactors are still 27%, which is embarrassingly too high, as it shows they aren't interested in keeping customers long term. Hermaphrodite horse at Hollywood Park? He/she/it (Mo Steam) can't run in straight filly races. I guess if I was a hermaphrodite in a public sauna, I'd want Mo Steam too. According to Pull The Pocket, handle is up 40-50% on that bet. I hope the management at Woodbine, and especially Fort Erie are taking notes. Fort Erie still has takeouts of 26.2% for exactors and doubles. If they fail, this will stand out as a major reason. You need to send a customer home with some money, or they won't come back too fast, if at all. British Columbia launched their now legal online gambling site on Thursday. It lasted only a few hours before it was flooded by too many site hits forcing it to shut down. Players last playing online poker and blackjack far longer than they do playing horse racing. And even though the games are unbeatable in the long term, they attract gamblers. The learning curve also is a huge factor and keeps players from giving horse racing a fair chance. But still, horse racing with a 21% takeout is unbeatable, so if you have to gamble, why not have fun and last as long as possible? It isn't hard to figure out why horse racing is lagging in growth. Those in control are generally ostriches who have to deal with and appease Jesters all the time. Race track execs want to believe that horse racing's woes can be solved using a combo of different things, but refuse to acknowledge that it might just be the way they price the game to the customer/Horseplayer (track takeout). Ideas from cheap beer in the infield to jockey bobble head dolls to dollar hot dogs have all been tried, yet horse racing handle continues to drop while the amounts bet on other forms of gambling have risen. Today's Jesters in horse racing are the old school racing exec, and many horsemen and breeder's groups, and some politicians in certain jurisdictions. They are Jesters because their demands for a bigger piece of the pie leads to a shrinking pie. They share a complete lack of understanding, and in some cases, caring, when it comes to idea of price sensitivity amongst the customers. In fact, some don't want to come to grips at who the customer is. Some horsemen believe they are the customer or at least a customer. Horsemen can be customers, but not the racetrack's customer, they are the customer of the breeders, the vets, the feed man, etc. But in the case of racetrack growth, the only customer is the Horseplayer. Their losses (and the losses of casino players, where applicable) pay for the track's operations and the purses that the horsemen receive. Increase the amount of Horseplayers, and the amount of times the Horseplayer wagers, and purse monies for the tracks and horsemen will increase. This also means that breeders will get more for their horses, as demand goes up with the prize money. In a perfect world, one would expect that the idea of optimal pricing would at least be tested, but the horse racing world is probably the most dysfunctional one in the Western World. There are too many organizations that stand in the way of growth. Enter Fred Pope, a marketing and advertising executive in Lexington. He just wrote a piece for The BloodHorse Blog: The Rise of Bet Takers in North America. In the blog piece, Pope bases all his assumptions on the false pretense that if the track that puts on the show gets a higher percentage from the bet taker, there will be money for the track and the purse accounts. Pope shows a total ignorance of the economics of the game and as a matter of fact, a complete ignorance when it comes to simple economics. He also fails to recognize the consequences of his plan on horse racing period. I also want to add that his comparing horse racing in the USA to that of France is pretty absurd (I think he just wanted to throw a wrench at the idea of exchange betting because Betfair is no longer allowed in France, but wait a minute, it is already not allowed in the USA). France, according to The Jockey Club's data, has the same ballpark handle as the USA does, but they run about 13% of the races the USA does. But what Pope doesn't mention is that in France, only 2.5% of handle goes to purses, while an average of 8.5% goes to purses in the USA (this of course includes subsidies from slots). It tells me that in France, that the bet takers (bookies) and/or government take a much higher percentage of wagers than in the USA. Does Pope really want a system where only 2.5% of the total handle goes towards purses? I don't think even he is a Jester of that magnitude. Pope wants those who put on the show to get a bigger percentage. On face value, it seems noble enough, but the repercussions would be disastrous. The blog piece seems to be geared towards ADWs which have been the benefactors of the shift of money being bet on live racing to money that is now bet online. He is right that handle should have soared because now people in most jurisdictions can bet anytime on any track. However, bettors have been lured to other forms of gambling where they can last, and also have a chance to win long term. 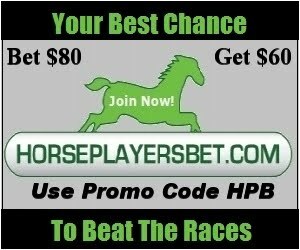 Horse racing has failed to compete for these players while takeout has marginally gone up in the past decades (thanks to a shift by bettors towards high takeout bets that have large returns that are now available each race). The only real growth horse racing is experiencing these days is via ADWs that provide rebates. Players last longer, get more into horse racing, miss fewer days, and in the long run, they are more likely to get family members and friends interested. Also, they spend less of their disposable income on other forms of gambling, as rebates give them the opportunity to possibly beat the game (if they are good and lucky enough). By increasing the fees tracks charge ADWs that offer rebates, the customer suffers the most, as the rebates shrink. This causes the player to play less, and take longer breaks between action, and perhaps, find new betting hobbies other than horse racing. In fact, all ADWs will have less of a budget to advertise as well. It is ADW advertising that helps pay for racing publications as well as advertising found on the internet and sometimes TV. Does horse racing need less advertising, especially now? Or less horse racing publications? I don't think so. .....the problem now isn't the ADW's, it is the receiving tracks where 60% of all off-track is still wagered. They get 16-17% and only pay the host 3-4%. While the tracks know the ADW's are going to steal their bettors, they will not give up the 17%. If they will just change the IHA (Interstate Horse Racing Act) and split the takeout when they are the "host", then they will move up from 3-4% to 9-10% and charge that amount or more to the ADW's, OTB's, and Casinos. Pope again hasn't really thought of the actual repercussions to this idea either. For instance, if this happens, Churchill Downs Inc., which owns a few tracks, will only focus on their products at their tracks, where they get the entire takeout (shared with the horsemen of their tracks). Do you think they will be in a hurry to take a bet on another venue that they have to pay half for? Maybe the major tracks that Horseplayers demand to bet on, but what about the smaller tracks? They have no chance at being on a racetrack's betting menu. So what happens if the smaller tracks receive 0% of track to track handle from other tracks instead of 3 or 4%? They might just have that final nail in their coffin. They should and will fight Pope's plan if it gets any legs. They have no choice but to offer their signals to other tracks much cheaper. What happen then? The tracks charging 8-10% to other tracks, won't be able to sell their signals. The reality the current distribution has been determined by free market fundamentals. And changing it will cause a downturn. But what happens if smaller tracks start closing? It isn't pretty. Less owners, less trainers, less backstretch employees, racetrack workers, etc. This will lead to less demand for horses because there will be less owners. Breeding prices will dive because there will not be enough outs to try to get even, if a horse turns into a dud, as most horses do. And there will be less people exposed to horse racing. Most people need some time watching races live before they become regular gamblers. Lots of people are exposed to horse racing for the first time by owners in small partnerships, as they go to the track to hopefully watch their friends horse win so they can get their picture taken. Of course, there are those who say there is too much racing right now, and Pope's idea could play right in their hands. Edit: I also have to add that if the smaller tracks disappear, and fewer horses are bred, and many smaller operations disappear, the governments may be less apt to give racetracks a percentage of the alternative forms of gambling. If this game reverts to the Sport Of Kings again, there will be little public support for throwing any slot money at it. If this game reverts to one only for the elite and their stables, expect no slot money in the future. I will not agree that there is too much horse racing right now. Nobody knows, because it is the jesters who have come out with this without exploring the idea of lower pricing first. Long before most business closes, they generally try to sell their product at lower prices in hopes that maybe the business can do better with bigger volume. This brings us to The Sage. First off, I need to correct Eng a little. Sports betting has a takeout of 4.6% for single bets, 10% for two team parlays and 12.5% for three team parlays. The average horse pays somewhere between the odds of a two team and three team parlay. He also left out poker and its low vig. Eng is on the right path with the article, though he seems content with just lowering the takeout on WPS. The cycle of growth always begins with the customer. If you want to sell more products, lower the price, don't raise it. Couldn't say this better myself. But where Eng gets it wrong, sort of, is that no matter how much a track promotes win, place and show, many Horseplayers will still be automatically attracted the idea of a high return gamble. But even for that, takeout matters greatly and the more a player gets back, the longer they will last. He is totally correct that tracks do promote the high return bets, and these have the highest takeouts usually, thus killing bankrolls the quickest. Yes, allowing for fractional betting of things like superfectas help attract the player to the bet, but what happens is that more of one's bankroll goes towards those wagers, which has an even more disastrous effect on the Player's ability to last. Another great point Eng makes is that keeping players in the game longer leads to higher handle and it is implied, that Horseplayers will lose more money in the end, as he states there will be more money for the owners and breeders. This is true, but it for reasons not cited in the article, but some that I've mentioned above in this blog post: Players lasting longer= Horse racing becoming more of a priority on the Horseplayers gambling/entertainment totem pole and with that comes perhaps more money being lost on horses versus other places of entertainment or forms of gambling, and perhaps it will lead to friends and family of the Horseplayer who lasts longer to get exposed to the track and betting. And finally, again not mentioned, with lower takeout comes the opportunity that there will be visible long term winners. Sure, a racetrack and horsemen depend on people collectively losing money, but visible winners will attract many people who will want to emulate the winners. And as any Horseplayer knows, horse racing for most is an addiction, regardless of success. But potential regular Horseplayers need to last longer, and the general public needs to have a reason (a beatable game) to give the game a long enough try. Taking a bigger piece from a shrinking pie will not lead to growth, but in most cases, leads to a smaller and smaller pies down the road. There is a lot of subjectivity when it comes to making many rules in laws whether they be in sports or in "real life." For example, in baseball, the rules could easily be 5 balls for a walk, 4 strikes for a strike out where a foul ball on the fourth strike counts as a whiff. Even the size and shape of the strike zone is subjective. But once the rules are in place, there should be little need for subjectivity by those who enforce the rules, especially in today's day and age with high definition replay abilities and the reality that almost every situation has happened before (when it comes to the major sports, including horse racing). I started losing interest in baseball when players became loyal to dollars over teams, but what really pushed me over the edge to ignoring baseball was baseball's dissing of modern technology. I remember when the realization hit me, I was at a Blue Jays game sitting directly behind home plate. High enough so that I could see the ball go directly over the plate. The umpire must have been suffering from astigmatism. Balls that were catching the outside of the plate were ruled balls, but balls clearly missing the inside of the plate by as much as a foot were called strikes. Yes, ever since I followed baseball I heard that every umpire has his own strike zone. Well screw tradition, that is just unacceptable today, so I walked away. Baseball can easily rectify things by using high tech lasers, not only over home plate but also on the foul lines. That recent perfect game that was taken away by a very bad call, should have been reversed immediately using instant replay. But this is not a baseball blog, lets move on to horse racing. Disqualifications in horse racing are as subjective as they come. There seems to be no consistency. The exact same thing could lead to a DQ one day and no change the next day. Consistency at one track is bad enough, but when looking for it from track to track, forget about it. This really needs to change. In 2010, horse races shouldn't appear to be determined by a coin toss between blindfolded judges. Define exactly what a foul is, and don't leave anything to the imagination. Horses can only move in a limited amount of directions, and jockey intent can easily be determined by watching a high def replay. And what about Ontario's new whipping law? I believe it states (I looked for the exact rule but couldn't find it) that a horse can be whipped up to two or three times in succession, and then must have "time" to react. How much time is time? A nano-second? The reason I bring this up is that it was brought to my attention, by one of my blog readers, that Eurico Rosa Da Silva whipped the Queen's Plate winner, Big Red Mike, a total of 17 times in the stretch. Twice whacking the horse 3 times in succession. And the time given for the horse to react reminded my of playing steam boat quarterback against a shady fast counter. I don't ever remember defining how long a steam boat "one banana" was supposed to be, but I do know that those who said banana as if it were a one syllable word were frowned upon. I want to add right now that I'm no fan of the whipping rules. As a bettor, I want the jockey to carry the horse over the wire if it comes to that. They are using the new feather whips, that should be fine enough...again, my subjectivity versus the subjectivity of what is a rule to begin with. However, rules are rules, and objectivity needs to be minimized if not eliminated. If the whipping rule is in place because of public perception, Da Silva's 17 hits, the slow mo replay from the tote board side sure didn't look good. And if it was enough to get him fined, than why shouldn't it also get a horse DQ'd. I believe in harness racing, whip violations can get a horse tossed, but not thoroughbred racing in Ontario. Why? Again, the subjective way rules are made. Isn't excessive whipping a form of cheating? Much like the use of a buzzer? I'd rather bet on the horse that got whipped 17 times in a stretch run against a horse that was whipped only 10 times. I'm going to take the wild assumption that whipping actually increases a horse's chance of winning in most cases, or whips would be abolished by now. Da Silva, by the way, was fined a whole $200 last year for excessive whipping when winning last year's plate on Eye Of The Leopard. This was before the new urging laws came into effect. This year, if in fact Da Silva did violate the rules after the Stewards subjectively look into it (because the rules allow for subjectivity), it could cost him a lot more dough. Again, I'd like them to lose the rule, but rules are rules are rules. I'm hoping that Da Silva did nothing wrong to violate the rules by the way (again 17 times in the stretch is fine with me, if I have my money on the horse), but I sure would like to know exactly what those rules are. This brings me to the case against Bruno Schickedanz. Yes, it was deplorable for him to bring in a 13 year old horse who made $1.6 million in purses back to the races, especially after a three year absence (though people were upset he ran at 8,9 and 10 as well). However, after reviewing the ORC 2009 Rules Of Thoroughbred Racing, I couldn't find what specific rule he violated. There anything in there about how old a horse can run til or how much time off makes a horse ineligible for life. Certainly there is nothing there about whether he could work out or not. to be an act of cruelty shall be a violation of the rules and the perpetrator is subject to a fine or suspension. In sufficient care or abandonment shall constitute cruelty under this rule. Was it an act of cruelty to bring in a 13 year old horse for a workout? Where do you draw the line? It is probably more cruel to workout a still sore racehorse who is on the vet list, no matter what age. (d) Impose a fine or penalty they deem proper. (e) Rule an of fender off the turf for any length of time it may deem proper. Talk about subjectivity! In other words, according the ORC's rules, they have a God-like ability to be subjective when dealing with things that make them feel uncomfortable (because they didn't have a rule in place to begin with like they should have). Again, I'm totally against what Schickedanz did, however I do believe that a rule should have been in place. There is no do doubt that what happened with Wake At Noon was prejudicial to the best interest of horse racing, but there should have been rules in place regarding the age of a horse with respect to time off to begin with. I cringe when I see a 10 year old mare entered who hasn't raced in 4 years, regardless of how many races or how much money she won. This is not something that should happen (if I can interject my subjectivity for a minute), and a specific rule should be in place. This situation has happened before, it isn't a blip on the radar. But as it stands now, I think most people agree that bringing back a horse at 13 who hasn't raced in 3 years is completely against the best interest of the sport. But where is the line? Is it a 2 year layoff, a one year layoff, a three year layoff, and what about the current age of the horse. It seems OK to bring back a 5 year old that was laid off since two, or even a 5 year old first timer starter. No matter, make a rule already. The ORC hasn't ruled as yet, however, Woodbine Entertainment used what appears to be their subjective powers to ban Schickedanz and trainer Tom Marino indefinitely. I went through the 51 page WEG Thoroughbred Rule Book as well. When it comes to shipping into the track, there are in-slip rules, which may or may not have been circumvented in this case. There is also a Coggins test requirement as well. Again, those look like the only things where violations could have occurred. Any horse 10 years or older that has run for a claiming price under $12,500 in the past 12 months and has not won a race in the past 12 months will not be ineligible to run at Woodbine. The way it is worded would have made Wake At Noon eligible to race. The word "and" is key, it is not "or." Wake At Noon didn't race at all during the last 12 months, so he definitely didn't run for under $12,500 claiming. I'm sure the rule implies that a horse who has missed a year and is over 10 isn't eligible to race, but that isn't what it says. And in theory, if he had gone to Mountaineer as Schickedanz intended and won a $5,000 claiming race, he would have become eligible regardless to race at Woodbine, which again, rubs everyone with a shred of decency, the wrong way. I also don't see anything about whether an ineligible horse can't workout or even have a temporary stall. Technically, a horse is not eligible to run until it makes time in a workout at the most 30 days before a race, if off a layoff. But obviously, these horses need to workout to become eligible, so even if a horse is ineligible to race, doesn't mean it isn't ineligible to workout. There are also all kinds of ponies on the track (many former race horses) who are in their teens. They get stalls. IFs rule in the land of subjectivity. If Wake At Noon hadn't broke down, Woodbine would have most likely taken no action. If Wake At Noon had his fateful workout at Mountaineer, I do believe no action from Woodbine would have occurred. Had it been at Fort Erie, that is tough to say what Woodbine would have done. They probably would have the same wait and see what the ORC is going to come up with approach that Fort Erie is using right now. Speaking of IFs, it was uncomfortable for me to watch Da Silva get off Big Red Mike as he suffered from heat exhaustion after the Plate. I know that the odd horse can collapse and die from heat stroke. Now what if he had suffered that fate? The 17 stretch whips would definitely come into play, and Da Silva would be taking a lot of heat away from Schickedanz. I want to know that Da Silva didn't over whip, without it being a guess, and I want rules in place that make it so owners like Schickedanz can't even think about bringing a 13 year old back after a 3 year lay off. Horse racing needs rules to objectively cover as many IF scenarios that it can envision, and the rules shouldn't be subject to subjectivity. The Queen will be at Woodbine on Sunday, probably for the very last time, to view the Queen's Plate. It looks like it will be a very competitive race. However two things happened this week, one that has anyone who has an just an ounce of humanity upset and looking for swift vengeance. The other thing dulls Woodbine's teeth when it comes to the way they control horsemen. Bruno Schickedanz did it again. What happened about ten years ago with Victoriously Bold was bad, but what just happened with Wake At Noon has many searching for adjectives that have harsher meanings than "despicable." In case you don't know by now, Wake At Noon, a classy horse who raced mostly at Woodbine during his career, was brought back to the track at 13 years old for a workout, after a 3 year retirement at stud, where according to owner Schickedanz he was shooting blanks. He broke down on Monday at the track and was euthanized. For one thing, he was not eligible to race at Woodbine, nor was he eligible to have a stall, even for a minute. He was shipped in from the farm, and somebody dropped the ball, not knowing the rules perhaps, and this allowed Wake At Noon access to the grounds. A full investigation is going on right now, so exact details have not officially come out. This is not any horse, though bringing back a horse 10 or over after 3 years off is very questionable at best, no, this horse won over $1.6 MILLION in his racing career, and most importantly, for the same owner who decided to bring him back to the track. I really have no qualms when it comes to horses who made over $500,000 or even a million running as geldings for low claiming races, if the money earned was made by another outfit and the horse was claimed at a higher level and made his way down the claiming ranks. If anything, it is the owner who made the money with the horse who shoulders the moral responsibility to buy the horse back and give the horse a good retirement or find the horse a good retirement home. This was obviously not the case with Wake At Noon. I don't think there is any way to explain this other than "Who would do such a thing?" It isn't like Schickedanz needs the action, he owns tons of mostly low to medium claiming horses who mainly run in Ontario. Jennifer Morrison broke the story on her blog in The Toronto Star. The story was also reported in Bloodhorse and the DRF. She has an update today with more links which include a blog and a couple of forum discussions. The question now is how Woodbine and the ORC is going to deal with this. On what grounds can Schickedanz be punished? Is it right to also punish the trainer severely as well? Will the ORC give him a break because his horses do fill races at Woodbine and Fort Erie, or will they do what the public demands? UPDATE: Bruno Schickedanz and his horses are barred from Woodbine's grounds, can't enter or race his horses there. Fort Erie has not made a decision yet. Now for the other black eye. Harness horseman Jim Whelan Wins Supreme Court Case Against the ORC and Woodbine Entertainment. This is, and it isn't a big deal. The judge ruled that Woodbine can enforce most of what they enforce right now, but that they can't pretend to have powers that they legally do not possess, anymore. Basically, they will have to reword Application for Access Rights of Woodbine Entertainment Group. What I see though is that they will not be able to act without due cause anymore. This is not really good for the bettor or the integrity of the game, as Woodbine, no matter that they were acting above the law, were doing a good job using the detention barn as a way to intimidate trainers not to cheat. This ruling might come at a bad time too, when it comes to how they can handle the Wake At Noon situation. Even though I'm not a Stronach fan, his horse Mobilizer looks like the horse to beat on Sunday. Trainer Roger Attfield knows how to get a horse to peak in the Plate, and this one appears to be getting better each race. Funny is that with his name, he isn't by Mobil. Giant's Tomb has a big shot as long as the track isn't favoring speed (which is hardly ever the case). Big Red Mike too looks like he'll be part of the exotics. He may have peaked in his last race though, I'm not crazy about his racing pattern. Mobthewarrior is my long shot throw in. He is by Mobil. He looks like he is ready for a peak race. I'm looking for Roan Irish to bounce out of the money and the fact that Hotep hasn't raced within 30 days, is a big mark against this one. Getting a horse to go a mile and a quarter off 36 days is a tough task when every horse in the field has been pointing towards this race. With the official change in management that occurred at Fort Erie July 1, Daryl Well Jr. opted to not be part of the new regime. Peter Kyte, who announces full time at Western Fair and was Fort Erie's full time announcer the last few years, will take over. I think Kyte vastly improved last year, and he was one of the better choices for the position. The Thoroughbred Blogger's Alliance members will be mentioning their views on this all weekend. Check out their blogs here. Personally, I have no problem with this. For example, if Fort Erie or any track wants to put $2 million to try to attract Rachel Alexandra and Zenyatta in a match race, more power to them. And if a tracks wants to just get one of the two, let them do all they can to attract them.